Looking for a venue that speaks to your company and your culture? 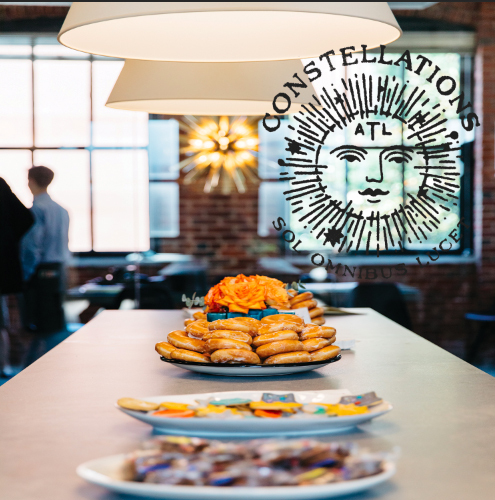 Constellations is a civic and socially-based shared workspace with mission, purpose and passion leading the way. Come visit us in Sweet Auburn, birthplace of the Civil Rights Movement and home to a rich and diverse cultural heritage. Our beautiful 1910 Neel Reid designed building offers a variety of inspiring spaces & experiences, tons of natural light, a historic location, and incredible New Orleans coffee complemented by delicious fresh-baked cookies. Also included: Nashville-designed, top-quality podcast studio, the latest audio-visual-tech amenities, board-quality conference room, and a stunningly beautiful library! Ready to book your event? Please see our spaces and availability. We're looking forward to meeting you! Please note, all meetings and events are subject to internal review and confirmation of approval.